WIP since I am about to head home for the day. Just making the thread for now. And thusly, she begat the first words of shipmanity. "Poi". A new home for me to lament about my terrible luck. Hooray! The last one to register lol. Now gotta grind out some fuel and level up some more destroyers for the fall event. 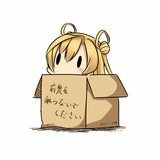 It's good to have a new home! 16 levels to go. 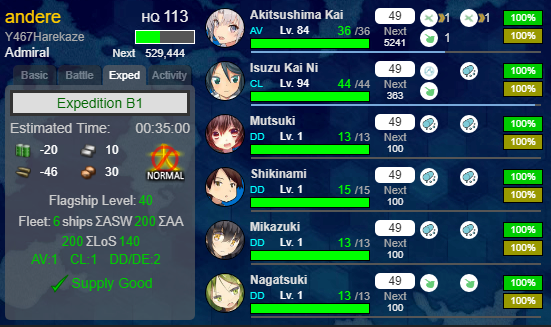 You can do it Michishio, join all your kai-ni desdiv 8. Need to buy more slots. I'm on 56k fuel, 40k steel 260k ammo and 40k baux. I think I might be ok! Wait, how did you manage to make ammo more than steel lol. That's like the 2nd hardest resource to gain after bauxite. I just bought 20 more ship slots. Should've unlink the CC from DMM. Too easy to buy things with only a few clicks. Tried a few times. Ended up doing it again. Just buy max slots like me. Then you're never tempted! 10,000 Yen to go to max slot. I'll refrain lol. exp 2 or exp b1? What ships does b1 need? Hrm, that's tough. Then again, spamming 2 means you can also run 5/21/38 for fuel and not lose out on ammo too much. You could bring underleveled kids there given that you have enough ASW, AA and LoS(200, 200 and 140). Yes, I'd say it's a good alternative to farm bucket. B1/5/21 or B1/37/38 seems like a nice expedition combo to build resources. I got lucky with RNG. Both Shimakaze and Yukikaze drop for me while I was trying to finish a weekly quest earlier. Shima's good when you only need DA from DD on night battle. 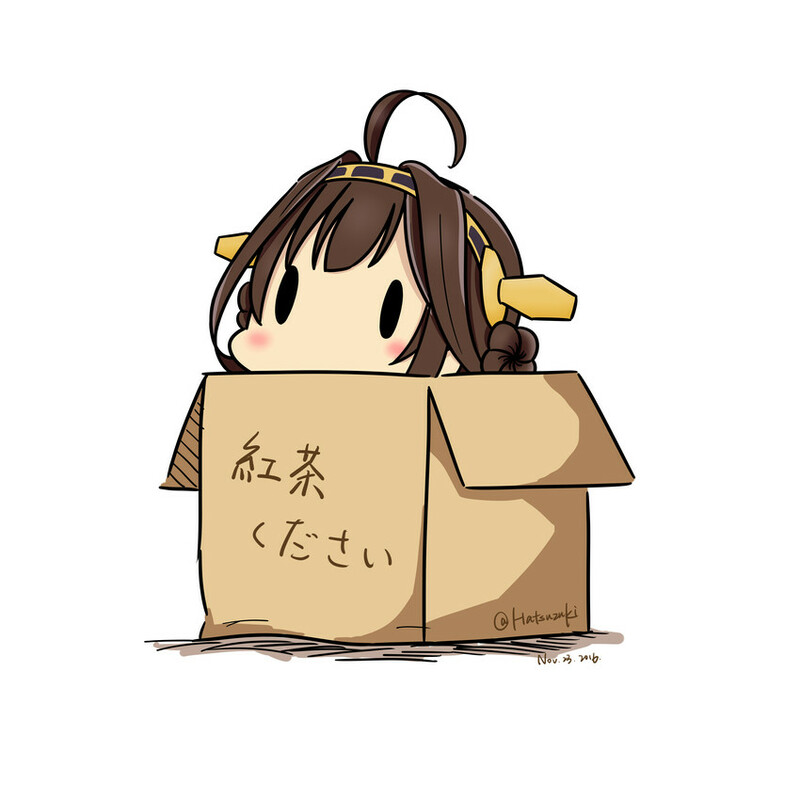 Yukikaze when you need TCI. ::Checks expedition history:: I am wrong :'(. Apologies. Seems like the fall event will start in the middle of November. I'd probably rush this one. Getting kinda busy end of the month. Hopefully not that big/hard. Luckily, there are no more old ship for me to farm this time (except Hatsukaze, why did I use her as mod fuel before lol). All foreign ship are in my base already. The event starts on the 17th, just in case people didn’t know :) that should give me enough time to level up some more DD and CA. Hopefully not much bug with 7 ships in a fleet, for both the game itself and the viewers. 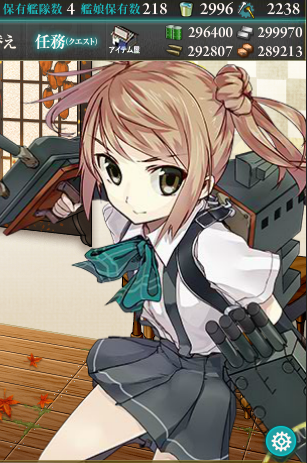 Good news is, I got Hatsukaze pre event after farming 3-4 for weekly world 3 + Mutsu + leveling Hatsuharu. Then I need to clear a few maps quickly to get an "Apology scroll" lol. Hype! 4 maps + new mechanics. 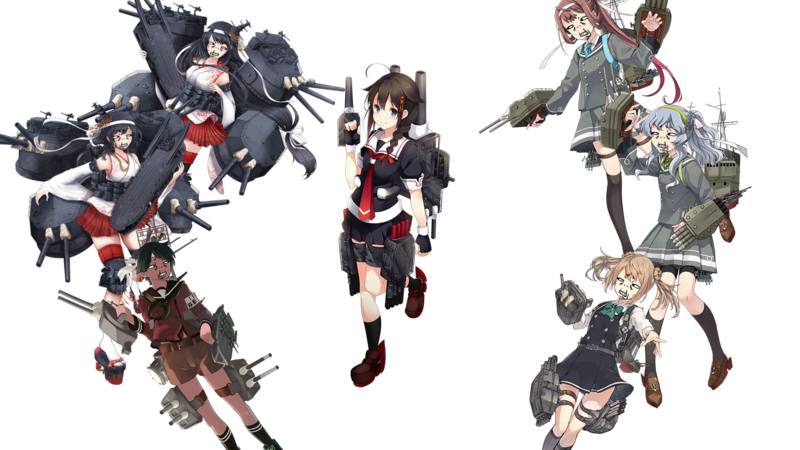 Only Shigure survived that battle (7 ships in a fleet). Others sunk from surprise attack hence the face after failing to retreat. Hopefully done before exercise reset. That's like 5 hours buffer.